-Be responsible for material take-offs from 2D drawings including underground piping systems, field tie-in isometrics, and pipe rack orthographic drawings. -Prepare requisitions for Piping bulk materials and Specialty Items. -Interfaces with Design, Material Engineering and Purchasing to ensure the timely delivery of all necessary Piping Materials to construction site and/or fabrication shops. -Be responsible for managing and monitoring work performed by dispersed execution offices. -Be responsible for monitoring change throughout all stages of a project and taking required actions. -Provide general project support to procurement, piping design, and construction. -Proficiency in Microsoft Office (Word, Excel, Outlook). -Provides construction engineering and mechanical technical support. -Examine and inspect work progress, equipment, and construction sites to verify safety and to ensure that specifications are met. -Train workers in construction methods, operation of equipment, safety procedures, or company policies. -Read specifications, such as blueprints, to determine construction requirements or to plan procedures. -Assign work to employees, based on material or worker requirements of specific jobs. -Confer with managerial or technical personnel, other departments, or contractors to resolve problems or to coordinate activities. -Estimate material or worker requirements to complete jobs. -Coordinate work activities with other construction project activities. -Supervise, coordinate, or schedule the activities of construction or extractive workers. -Analyze worker or production problems and recommend solutions, such as improving production methods or implementing motivational plans. -Order or requisition materials or supplies. -Record information such as personnel, production, or operational data on specified forms or reports. -Arrange for repairs of equipment or machinery. -Provide assistance to workers engaged in construction or extraction activities, using hand tools or other equipment. -Suggest or initiate personnel actions, such as promotions, transfers, or hires. -To monitor construction activities to ensure that all activities are conformed to project specifications. -To compile all inspection reports for project hand over. -To aware of project specification. -Supervise and assist in daily warehouse and shipping areas including:Filling and shipping customer orders, satisfying internal shipping requirements (technical service, vendors, etc. ), ensuring accuracy of shipments and supporting documentation, receiving incoming material and routing to appropriate area or personnel, filling work orders from production, packaging assemblies and receiving into finished goods, ensuring inventory transactions are accurately logged and overseeing cycle counts and reconciliation activities. -Measuring and reporting the effectiveness of the department activities. -Developing and maintaining departmental work instructions for all tasks. -Establishing or adjusting work procedures to meet warehouse demands as dictated by production schedules and work flow. -Interpreting company policies to workers and enforcing safety regulations. -Recommending measures to improve quality of service, increasing efficiency of department and work crew and equipment performance. -Continuously improve warehouse operations through the use of lean enterprise practices. -Conferring with other supervisors to coordinate activities of individual departments and serving internal customers. -Education & Experience: Associates Degree / Diploma and 10 to 15 years of relevant warehouse experience (including supervisory experience), or equivalent combination of education and experience. -Ability to read and interpret documents such as safety rules, operating and maintenance instructions, and procedure manuals. -Ability to make calculations such as discounts, freight estimates, dimensional weight, invoices, and percentages. -Knowledge of general business computer software and aptitude to learn new software applications. Description Carries out the complex fault finding, repairs and preventative maintenance on a variety of Mechanical (Gas turbine, compressor, Diesel Engines, pumps etc) on the assigned production platform and remote well head platforms. Performs technical, craft specific corrective maintenance (example: centrifugal pump troubleshooting and repairs). Works is sometimes conducted with the integrated team to resolve problems which could be multi-craft in nature. Identifies requirements for major repair, replacement and or workshop reconditioning work to be carried out in Jebel Ali. Updates preventive maintenance records. 1. Receives incoming work requests, discusses work required with the Mechanical Supervisor, and estimates time, materials or spare parts required to complete the work. Receives schedule of repairs, with appropriate "permit to work" and arranges for tools, test equipment etc. 3. Carries out on the platform workshop repairs of mechanical equipment. Includes stripping down units, change/ replacement of parts and bench testing equipment before re-installation. Identifies requirements for consumable supplies, tools and equipment to aid the efficient and effective offshore operation. 4. Ensure that shift handovers are communicated effectively and that standard procedures and written instructions are understood and adhered to at all time. 5. Carries out all activities in accordance with Company safety procedures and manufacturer's recommendations, ensuring that all precautions are taken to isolate equipment prior to commencing work. Follows all safety instructions and notices, and wearing protective equipment at all times. 6. Completes work orders/cards with details of maintenance or repairs carried out, fault diagnosed and materials and man hours used to complete the work. 8. Assists in major shutdown and overhaul work, which includes the dismantling, testing of mechanical equipment including Gas Turbines, Compressor, Pumps and Engines. Reviews history on mechanical breakdowns or trips and identifies areas for continuous improvement to Mechanical Supervisor. 9. Ensures that the mechanical system and equipment is installed, tested, pre-commissioned and commissioned according to company requirements. 10. Assist other trades and disciplines as required within the limits and capabilities and experience. 11. Performs basic rigging and slinging duties. 12. Participates in Company Horizon Zero and STOP safety programs. 13. Work towards completion Company Competent Person Profile (CPP) assessment scheme. 14. Performs Emergency Response Role as required by company. 16. Maintain good communication between the Maintenance crew and Operations team. The daily maintenance / shutdown reports of the equipments will be recorded and mail to Sr. Mechanical Technician / Mechanical Planner / Mechanical Supervisor in daily basis to enter in to the maintenance management system (Maximo). - 4-5 years' varied installation maintenance and repair experience in a industrial environment, ideally within the Oil & Gas/ Petrochemical industry. Description The Production Operator (Wells) is responsible for the safe, efficient and effective operation and maintenance of the Wells, Processes, systems and equipment in the assigned area of responsibility. Carries out a range of operations and maintenance activities in the assigned area of the production platform. 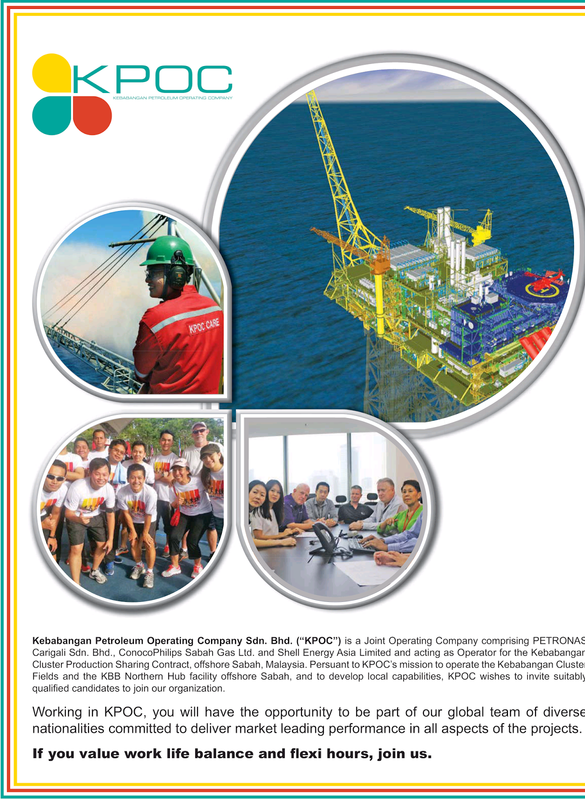 Carries out various operational activities on the wellhead platforms to ensure that oil/gas productions are met as per production target and services of Operators and contractors on assigned platforms to safely and efficiently achieve established production objectives with in company policies and procedures. 1. The Production Operator, Supervises & is accountable for directing contractors on all assigned platforms to carryout maintenance activities in accordance with approved procedures and manufacturer’s recommendations. He carries out variety of operational tasks, Including NFT, ACP diagnostic, Monitoring SCADA / DCS / ESP, NORM testing, , Echo enter usage, control system, implementing routing checks on platforms as per operators checklist on daily weekly basis. 3. Provide accurate and clear communications to the SPS and frequent contacts on the platform to control and provide information on ongoing production conditions, performance, and maintenance program. 4. Understand and have knowledge of the company’s Emergency Response Procedures, & perform emergency response duties and tasks. 5. Good knowledge of MCDR (Mechanical Corrosion Damage Reports), CAF (Change Approval Form), ORA (Operational Risk Assessment), initiation and completion, maintaining a list of WO. Tracking of MAXIMO backlog, raising work order request to ensure timely follow up. „X Completion of Secondary education with minimum 2 years on the job training in operations and or maintenance. (Graduate or Diploma holders in Chemistry, Electrical or mechanical engineering are preferable). 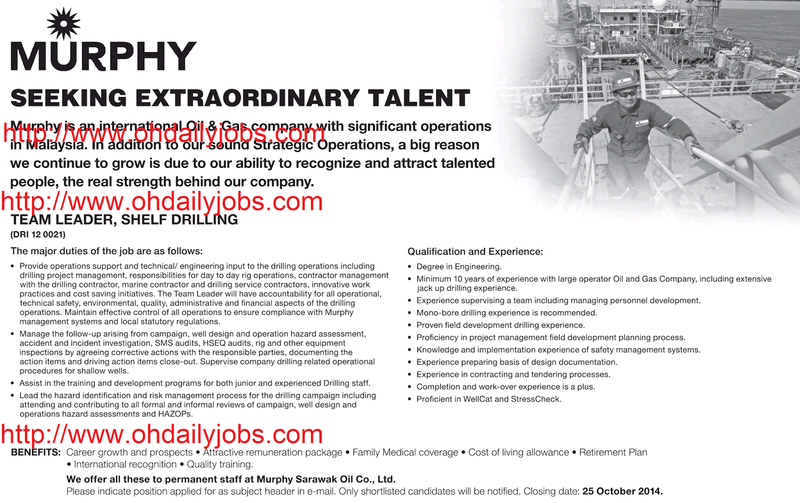 „X 3-5 years experience in oil /gas process industry with knowledge and experience in the use of modern process control and production systems, preferably in an offshore environment, including two or more of the following specializations. „X Thorough knowledge of well completion, process flow and safety system. „X Good understanding of gas lifts valve and its operating procedures. „X Thorough knowledge of operation of pumps, turbines, compressors, power generator and well equipment. „X Basic knowledge about drilling, work over, well intervention operations. „X Basic understanding of wells, down-hole equipment and gas lift operation. „X Through knowledge of fluid separation and well testing. Also good understating of pneumatic and electronic level/pressure/flow instruments. „X Ability to interpret process flow, safety system and well completion schematics. „X Well testing and water cut analyzing. Knowledge of basic flow measurement calculations and measurement equipment. „X Business Management (Maximo, MS office 2003/2010, DP intranet, Live link applications, Crane Operations), Planning Prioritizing, Risk Management., Crane operations. „X Personnel Management: Time keeping, Safety leadership, Confidence, & Self awareness. Description Outside unit operator responsible for the safe, efficient and effective operation and front line maintenance of the processes, systems and equipment in the assigned area of responsibility. Operating Issuing Authority for the assigned area of responsibility for the PTW system.1. The safe, efficient and effective monitoring and operation of all processes, systems, and equipment in the assigned area of responsibility. 2. The timely execution of the Planned Preventive Maintenance, (PPM Program), for the assigned area of responsibility as detailed in the 28 – 7 day plans, and recording of results in the Maximo. 3. The routine inspection, monitoring and recording of operating conditions in the daily shift Reading Sheets and the keeping of accurate daily / shift records of equipment and systems status and any changes in the daily logs. 4. The routine inspection & monitoring of the process consumables and the organization of replenishment(s) as required. 5. The routine starting /stopping of equipment &/or adjustments to the process & equipment as directed by the Control Room Operator (CRO). 6. The identification and reporting of corrective maintenance requirements/ corrosion / anomalies / structural defects within the assigned operating area. 7. Safe starting or shutting down of Units / Platform in co ordination with CRO. 8. Alternate and backfill as required with the Senior Operator-Tech. 9. Ensures his work area is well maintained and carries out house keeping in his area of responsibility. 10. Provide technical knowledge and experience in diagnosing and resolving operational problems, &/or identification of opportunities for improvement. 11. Provide accurate and clear communications to operations and facilities team personnel to enable meeting of team targets and goals. 13. Clear and accurate communication with the facilities support teams in the delivery of support services to the operations and maintenance efforts. 14. Understand and have detailed knowledge of the company’s Emergency Response Procedures. 15. Perform emergency response duties and tasks as defined in the company’s Emergency Response Procedures Manual and the installation station bill. 16. Perform emergency response duties as a Fire Team member. 17. Participate in STOP/ Horizon zero program and report all unsafe acts, behaviors and conditions. 19. Undertake the planning, preparation, and execution of equipment &/or system isolation as required for routine PPM, Corrective Maintenance, maintenance &/or projects campaigns; &/or integrity verification inspection, as specified on the relevant work request and PTW. 20. Control access within his area of responsibility to engineering, inspection, maintenance, & /or facilities staff under the PTW system requirements & guidelines. 21. Continuously or periodically monitor the work activities and progress to ensure compliance with the PTW requirements and restrictions. 22. Ensure an accurate and complete handover to the next shift &/or operating team of the status of all ongoing works. 23. Undertake the final inspection at the completion of all works, ensuring the works have been completed satisfactory to the scope and PTW requirements; all tools, materials and debris removed; where applicable, determine that the equipment / system is deemed to be worthy of returning to service; and execute the closure of the PTW, & work request. 24. Understand, monitor, check parameter Trends and intervene where necessary to ensure the safe, efficient and effective operation of the outside utility systems, oil processing, effluent treatment plant, and safety systems and equipment, whilst avoiding unnecessary processing upsets &/or equipment shutdowns. 25. Coordinate and monitor the routine utility, process, and effluent sampling and analysis, ensuring the results are within the quality and environmental control parameters, and making adjustments as required to meet prescribed QAQC standards, whilst optimizing on the consumables usage wherever possible. 26. Understand, monitor, check parameter Trends and intervene where necessary to ensure the safe, efficient and effective operation of the sea water lifting and filtration; sea water treatment and de-aeration, high pressure pumping system; utilities generation; and safety systems and equipment, whilst avoiding unnecessary processing upsets &/or equipment shutdowns. 27. Monitor the routine utility and process sampling and analysis, ensuring the results are within the quality and environmental control parameters, and making adjustments as required to meet prescribed QAQC standards, whilst optimizing on the consumables usage wherever possible. 28. Maintain water injection rate and pressure as recommended by engineering. 29. Assist with the preparation and execution of routine PPM maintenance. 30. Assist maintenance team whilst Crank Soak washing the gas turbine engines and generators. 31. Understand, monitor, check parameter Trends and intervene where necessary to ensure the safe, efficient and effective operation of the gas compression systems; gas lift circulation system, high pressure gas re-injection system; utilities generation; and safety systems and equipment, whilst avoiding unnecessary processing upsets &/or equipment shutdowns. 32. Monitor the routine utility and process sampling and analysis, ensuring the results are within the quality and environmental control parameters, and making adjustments as required to meet prescribed QAQC standards, whilst optimizing on the consumables usage wherever possible. 33. Assist with the preparation and execution of the routine PPM maintenance. 34. Assist maintenance team whilst Crank Soak washing the gas turbine engines. 36. Understand, monitor and intervene where necessary to ensure the safe, efficient and effective operation of wells and process equipment. Ensures Safety system is fully functional. Eliminate unnecessary production loss and process upset by taking timely corrective action. 37. Perform trend analysis of gas injection rate, tubing and casing pressures of oil producing wells. 39. The routine well opening and shut-in, adjustments to the process & equipment as directed SPS/Senior Production Operator. 40. Assisting in the coordination of Wire line and well intervention activities. 41. 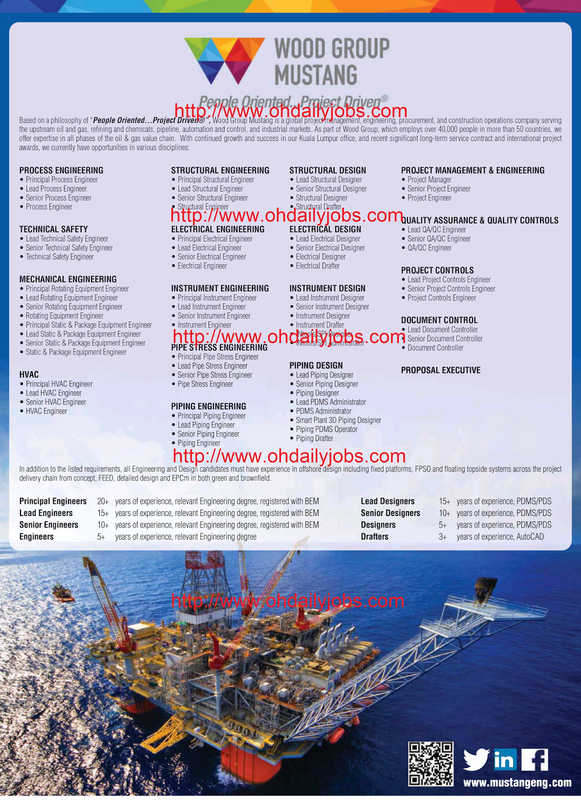 Provide operational support on rig for drilling department during drilling/ work over operations. 42. Ensures his work area is well maintained and carries out house keeping in his area of responsibility. „X Crude separation / stabilization. „X Effluent treatment / disposal. „X Sea water filtration, de-aeration, treatment, re-injection, (turbo-machinery). „X Utilities, (Turbo-Power generation; electrical power distribution; pneumatic power compression & conditioning; water and fuels systems). „X Controls & safeguard systems. „X Gas / water / Hydro carbon treating / process plants. 10. 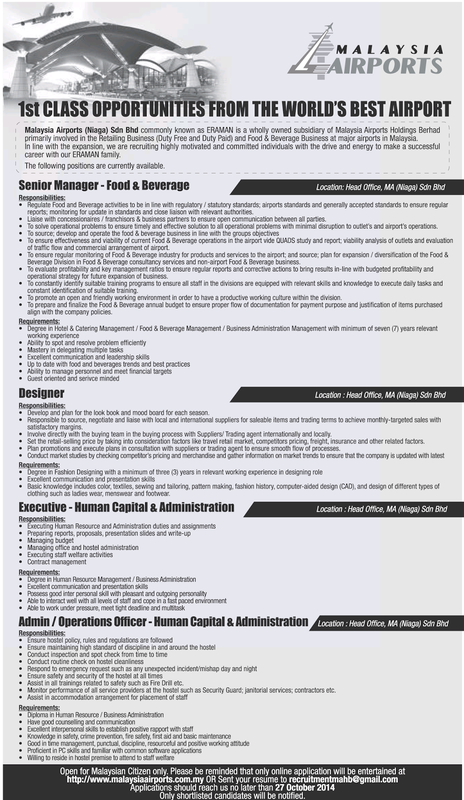 Undertake any duties as assigned by the Head of Business Unit & Marine Growth Control. Overseas travel and accommodation arrangement. Mature, positive attitude and highly motivated individual. High level of integrity, extremely well organized and meticulous. -Perform general secretarial duties and administrative functions. -Handling day-to-day administrative and operational matters. -Preparing confidential correspondence, reports and minutes of meeting. -Arranging & monitoring travel arrangements, meetings, and daily appointments. -Handling general requirements/general affairs, routine and other functional duties as and when required. -Candidate must possess at least a Degree or Diploma in Secretarial, Business Studies/Administration/Management, Human Resource Management, Mass Communication or equivalent. -Minimum 2 years experience handling secretarial matters. -Strong coordination and interpersonal skills, and able to work with initiative and under minimum supervision. -Possess excellent interpersonal and communication skills. -Excellent in both spoken and written English as well as Bahasa Malaysia. -Abiltiy to build good working relationship with work group and possess strong communication skills with the ability to interact across all levels of the organisation. -Mature and with a pleasant personality, self-motivated, multitasking and able to work independently under challenging environment. -High level of professionalism in handling private and confidential matters. 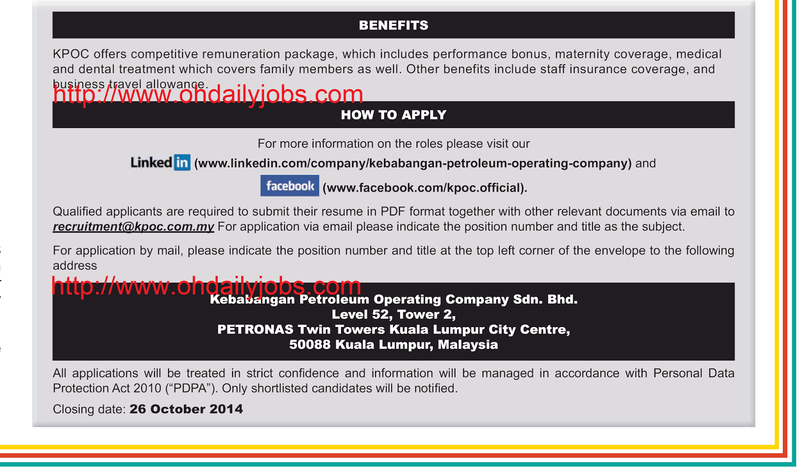 -Applicants must be willing to work in Kemaman, Terengganu. FIELD ENGINEER is Urgently Needed..!!!! Execute and implement all work/contracts in consideration of Innovative Oilfield Services Sdn. Bhd. within business objective to address the company needs for all Projects and related activities. We invite you to join our team. Please send your curriculum vitae to admin@iossb.com.my with details of your professional qualifications, experiences, native language and areas of specialization. Overview External: Chevron is one of the world's leading energy companies, with approximately 60,000 employees working in countries around the world. We explore, produce and transport crude oil and natural gas; refine, market and distribute fuels and other energy products; manufacture and sell petrochemical products; generate power; and develop future energy resources, including biofuels and geothermal energy. 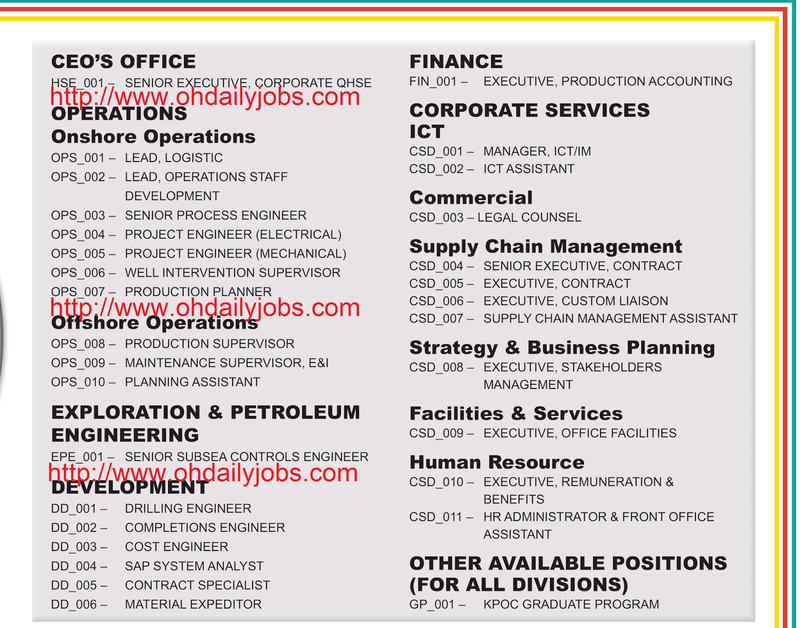 Chevron Oronite is accepting online applications for the position of Senior Instrument & Electrical Technician / Instrument & Electrical Technician in Jurong Island, Singapore through 31 October 2014 at 11:59 p.m. (Eastern Standard Time).All interested applicants, please read the Data Privacy Notice before submitting application. Selected candidate will work in Singapore under the local payroll system and benefits. Able to produce technical reports, engineering proposals, review and recommendations. Review operation procedures, manuals and update if necessary. Monitor and assess technical performance of equipment and personnel. To support the Management in ensuring smooth efficient operation of the various projects of the Company. Assist the in planning of projects and other related tasks. Developing the best methods for project activities, and determining the optimal sequence of operations on the project. Candidates must possess a Degree in Engineering, Technical or Operations Management. Problem solving skills are highly valued in this profession. Experience working in offshore crane, hoist & lifting equipment related companies will be an added advantage. Ability to review design and perform structural calculations will be an added advantage. Knowledge of engineering software like AUTOCAD, NASTRAN, hydraulic programs would be an added advantage. Knowledge in HSE (Health, Safety and Environment). Must be computer literate and proficient in Microsoft Office. Must have experience in offshore pedestal cranes. Shall have at least five (5) years experience in supervisory positions leading and managing field work in crane maintenance or crane repair and rebuild projects. E&I Technicians should be able to carry out inspection and maintenance of electrical system, motors and electrical control systems of cranes. Must be able to work independently with minimum supervision. Self starter and motivated. Must be target driven, organized, adaptable and be willing to work extra hours, when needed. Attractive remuneration and working conditions will be offered in this role, as well as the opportunity of unlimited professional growth and development. RABUTEC SDN. BHD. / RABUTEC (SINGAPORE) PTE. LTD. 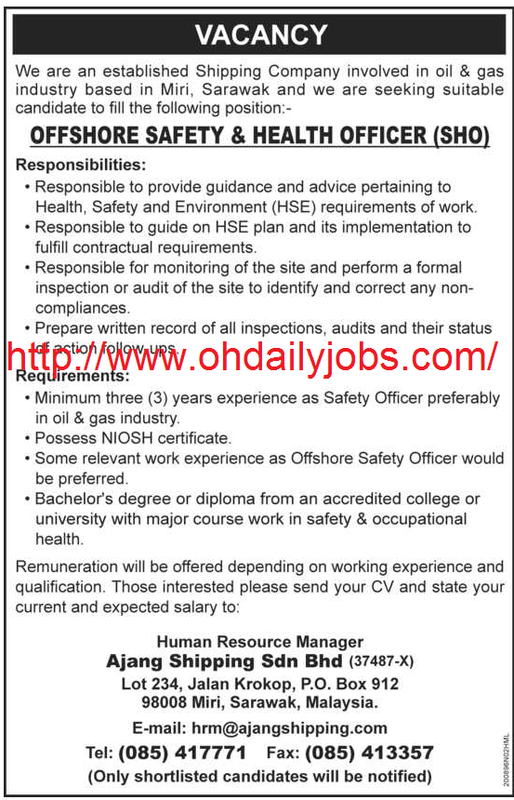 Candidate must possess at least a Professional Certificate, Diploma, Advanced/Higher/Graduate Diploma, Engineering (Chemical), Engineering (Electrical/Electronic), Engineering (Petroleum/Oil/Gas) or equivalent. 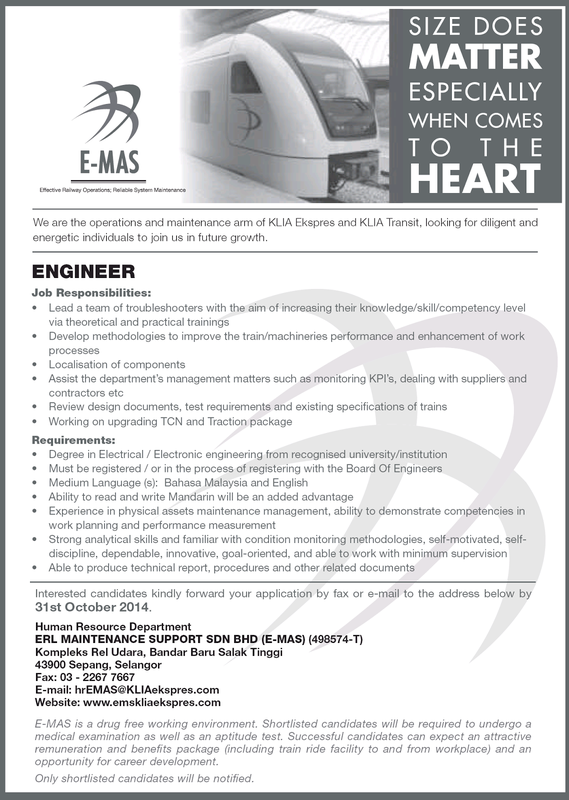 Applicants must be willing to work in Putra Height. Preferably Junior Executives specializing in Engineering - Oil/Gas or equivalent. Prepares basic level CAD detail and assembly drawings. Calibrate field instruments, troubleshoot all instruments analyzers and devices. Analytical Solution & Engineering Sdn Bhd is a Gas and Liquid Instrumentation Company which is fast growing & continues developing. You must enjoy performing the full cycle of service operation and must have the capabilities & outstanding skills to troubleshoot, to perform testing & commissioning skills on electrical electronics products. You will understand how to find fault down to component level as often a problem or fault will be dissected in a number of different ways to get the best possible solution. You will prepare and update a service report after each site intervention and most importantly, you have solid follow up skills with strong initiative to response to customers complaints effectively. Must be able to converse in English and Bahasa Malaysia. Most of all, you have a great attitude and enjoy working in a top quality team. We invite you to contact us & tell us about yourself, your directional drive and your passion to succeed. Do come and and share with us. Candidates will be happy to know that INEAX offers a strong base salary which reflects your talent and potential, while getting the opportunity to learn from some of the most talented professionals this industry has to offer. Working hours: 9.00am - 6.00pm, Mondays to Fridays. • To attend to enquiries and reception duties; including telephone calls and occasional visitors. • To manage incoming and outgoing mail and emails. • To maintain an efficient office administration, including company documents and secure records for the management. • To assist in Human Resource matters. • Posses’ positive attitude, excellent presentation & communication. Interested candidates are invited to send your resume starting earliest available date, qualifications, experience, present and expected salary, recent photo, contact number and email to admin@esteem.com.my. Only short listed candidates will be notified. To carry out scheduled and unscheduled maintenance activities for the ERL trains and systems in accordance to the procedures as assigned. Ensure all tasks related to receiving, issuing, repairing, transfering and storing of material equipments are properly executed. To ensure that the warehouse and all its storage locations are secured at all times. Please note: Only shortlisted candidates will be notified.